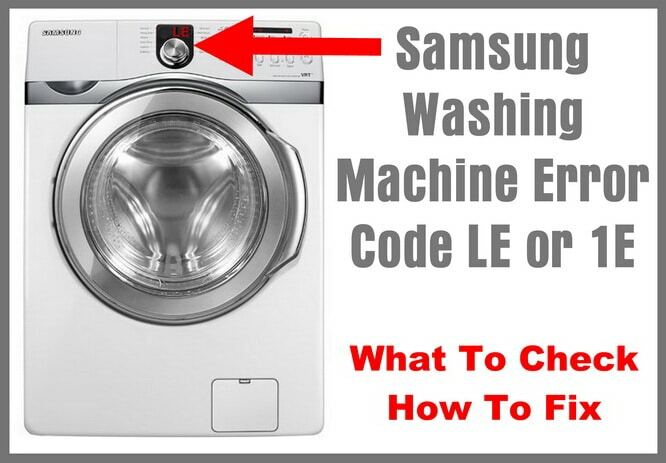 Is your Samsung washer showing the error code LE, Le, lE, le, 1E, 1e, or suds fault code? This indicates an issue with OVERSUDSING or a faulty WATER LEVEL SENSOR. The errors you may see on your Samsung washer’s display will usually be caused by using an excessive amount of softener, detergent, non-HE detergent or bleach. If you know for sure you are not using too much softener, bleach, or detergent, then you need to look into the possibility of too much soap residue, checking the hoses and filters, or a faulty WATER LEVEL SENSOR. Samsung washing machine error code LE means the washer has tried to fill but has not reached the proper water level. Check the water supply valves are fully opened. Make sure your water supply is a minimum of 20 psi. If you are using a non-HE detergent on your HE washer, or too much detergent, this will cause excess suds, odors, fault and error codes, and water leaks. Be sure to use high efficiency detergent to prevent excess suds. Be sure the door is closed. Be sure the door seal is clean and free of debris. Be sure the water hose connections are tight. Be sure the O-rings on the water hoses are installed properly and not torn. Be sure the end of the drain hose is situated no more than 6 inches into the drain pipe. Be sure the drain pipe is secured. Be sure the washing machine is 100% level. Be sure the detergent drawer is closed. Do not use excessive detergent. You may also have soap residue that is causing the error. To prevent this you need to remove the soap residue from the washer. Open the washer door and be sure the tub is empty. Open the detergent drawer and be sure that it is completely empty. Once the detergent drawer is empty, run a Sanitize cycle or Pure Cycle/Self Clean. When the washer fills and begins the washing cycle press the Start/Pause button. The washer will pause and the door will unlock. Open the door and check the water in the tub. If the water in the tub is soapy or has suds then there is soap build up in the unit from using excess. Close the washer door and press the Pause/Start button to complete the cycle. If you see suds in the washer tub, run empty cycles empty with no detergents until the water in the tub is clear and no more suds appear. If all of the methods above did not help clear the error code, the you may have a water level error. Make sure the hot and cold water supply hoses are not kinked and the water supply valves are open. NOTE: Water pressure in the home must be between 30 pounds per square inch and 120 pounds per square inch for your Samsung washer to operate. When only cold water is connected to the washer, a splitter must be used to ensure that both of the washer’s inlet supply valves are supplied with water. Make sure the drain hose is not inserted too far down into the home’s drain pipe. This can form a vacuum or syphon. The pressure formed from the vacuum can cause the pressure sensor to believe the tub has reached the correct water level. When this occurs the water valves will close and prevent anymore water from entering the washer. Make sure flood safe/check hoses are not installed on your Samsung washer. If flood safe hoses are installed then replace them with rubber supply hoses. NOTE: Flood safe/check hoses are not recommended because they may restrict water flow to the washer and cause this issue. Make sure the water inlet hose filters on the back of the washing machine where the water hoses connect are clean. Now run a test wash and see if the error code has been cleared. NOTE: Samsung front load washers use 13 gallons of water per cycle. The 13 gallons is the total amount of water used throughout the complete wash cycle. The initial fill does not add 13 gallons. During the initial fill, the machine may not appear to have enough water, but this is normal. Your washer adds water after the initial fill to properly mix in the detergent. Remove the top off the machine by removing the screws along the back. Inside the top of the machine you will see the pressure switch. It has a plastic tube attached, pull the plastic tube off and then blow into the tube. This will clear any lint in the tube. After this test the washer. 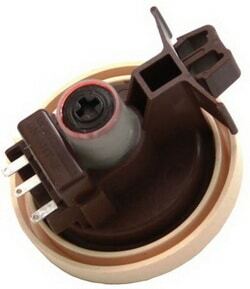 If this has not fixed your Samsung washer, then replace the water level switch. What does the water level sensor in my Samsung washer do? The sensor tells the control board when there is enough water in the tub and to stop filling with water. It then tells the control board that the tub is empty and to start spinning. Getting the LE error code and need help? Leave your question below in the comments and we will assist. Hi I’m getting LE1 error when the mashine is dormant. I mean, when mashine is turned off but is plugged in. Like, in the midlle of the night it starts beeping and showing le1 error. Any suggestions? I am getting the LE code on my Samsung FL and have checked everything. I have good pressure and water flow. Machine does initial fill then agitates and fills some more. Agitation stops and machine fills again until it’s about 2″ up the door glass then stops with the LE error. I have removed the pressure switch hose and blown into it. It is clear and blowing air bubbles into the water filled tub. I replaced the level sensor and it still does not work. My washing machine is not staying on long enough for me to do any of these troubleshooting steps before the IE message comes on. I have a Samsung VRT WF520ABP that had the relay go out on mainboard for drain pump. I replaced the mainboard. Now it says 1E error water level sensor error. I returned the mainboard and got a different one. Same error. I replaced the water sensor twice. Same error. I checked the tube for kinks and debris, its clear. The error appears when I power it up and attempt to start a cycle. If I manually add water thru the soap tray it pumps the water out and the error still appears while its pumping it out. Dan did you resolve this issue? I’ve tried everything you did for the same cause, my next step is the door lock and thermistor, what fixed your issue if you don’t mind sharing. I have a problem of Error Code 1E on my SAMSUNG Top Load 6.2 Kg Washing M/c (WA82VSL). The Washing machine starts up, water flow into tub for 5 sec, tub checks for rotation and the error pops up suddenly the whole operation stops. Does the Samsung washer spin after filling with water or does it stop and display error code before it starts to spin? As in – Fills with water and THEN displays error code? Also, is it a 1E or IE error? Samsung IE error code tells you that the washer has detected a water level sensor failure. If IE is the error code, check the water level sensor wiring and if all looks good, test it and if faulty, replace it. Check your vacuum line. It goes in to your water level sensor (switch). If it gets loose it will rub on the drum during the spin cycle. And will eventually wear a hole. I have done all the checks and still I have an error. I have an LEl error which appears on my Samsung ecobubble washer dryer (WD906U4SAGD) machine. The machine powers up and then the error appears. When i power off the machine the error remains flashing. I have done the troubleshooting steps mentioned in the guide above to no avail. I have noticed that the chime that sounds upon power on/off is very faint as well. Water valves do not open. Machine ready signal does not occur. Red indication light on selector switch just flashes n then LEl error appears on display. Any advice would be appreciated to diagnose which component(s) r faulty. The water valves DO NOT OPEN? Are you getting water to the Samsung washer? What happens the moment you power the washer ON? Does the error show immediately? 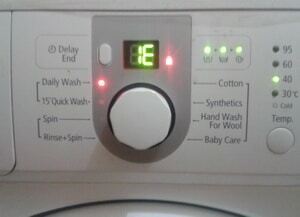 My washer fills with water and then displays LE code and stops working. I replaced the water sensor switch and it is still doing the same. I have the Samsung B1445AS, and keep getting the IE code with 5 minutes left to spin. I’ve just changed the brushes and checked all the solutions above. Apart from changing the water sensor not sure what else to check? I have the diamond drum 6.5kg Samsung top loader washing machine. Which is displaying the IE error code. We have checked the faults as above and can’t see a problem. The washing machine itself isn’t taking water into the machine. Is there an easy fix for this. Please help!! The Samsung 1E = Water level sensor error. Water level sensor is bad. Turn off the appliance and wait 30 seconds. 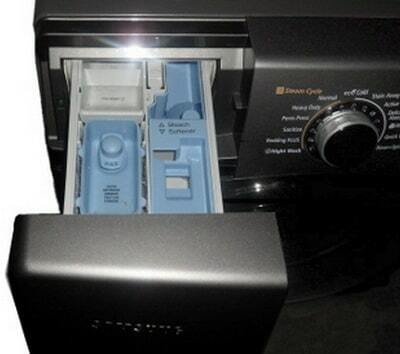 Switch appliance back on again and start a wash cycle. The Samsung LE = Natural drain – Water leak – Low water level detected during cycle. Check that the drain hose (on back) is not lower than the base of the washing machine. Also check for a water leaks. If no water leak then switch off the power for 30 seconds and try again. If water does not enter washer be sure the water supply hoses are okay, mesh screens are not clogged, and the water valves are fully open. If all else fails, check the water inlet valve for faults.